Laptop Magazine is confirming that the Asus Eee Box is headed to the US. The Eee Box is the first desktop PC in the Eee PC lineup. It’s basically a tiny computer with no optical drive, an 80GB hard drive, a 1.6GHz Intel Atom CPU, 1GB of RAM, and a $349 price tag. In other words, it’s a lot like the Eee PC notebook, but a bit cheaper and a bit less portable. Laptop’s Joanna Stern also shot a little video demonstrating the Express Gate software that comes preloaded on the Eee Box. ExpressGate is the Asus version of Splashtop, a super light-weight, Linux-based operating system that can be installed on a motherboard. 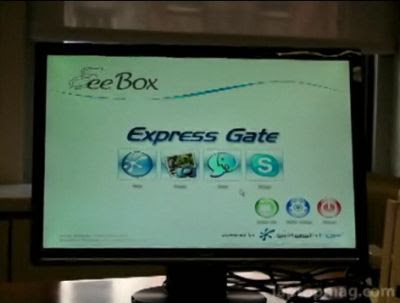 You can launch Express Gate within seconds of hitting the power button, which means you can access a handful of programs like a web browser, chat application, photo editor, or Skype without waiting for Windows XP to load fully. Stern points out that while it takes just a few seconds for the Express Gate interface to pop up, it takes a little longer to actually get your applications up and running. But using Express Gate, you can load a web browser and connect to the internet in just over 30 seconds, while it takes almost a minute just to load a working desktop in Windows XP. Keep in mind, Express Gate and Splashtop software performance will vary from machine to machine. The Eee PC is running a low-power CPU that’s designed more for efficiency than speed. A faster machine will probably load applications more quickly.